As rugby people know, the world is not round, it's ellipsoid. In actuality the earth is wider at the equator than at the poles giving it a shape of an oblate spheroid, defined as "a rotationally symmetric ellipsoid having a polar axis shorter than the diameter of the equatorial circle whose plane bisects it". 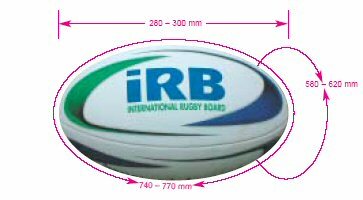 A rugby ball on the other hand is a prolate spheroid which is "a spheroid in which the polar axis is greater than the equatorial diameter". Material: Leather or suitable synthetic material. It may be treated to make it water resistant and easier to grip. Air pressure at start of play: 65.71-68.75 kilopascals, or 0.67-0.70 kilograms per square centimeter, or 9.5-10.0 lbs per square inch. Why spin a rugby ball? In order to make it go further with more accuracy and the two scientific principles involved are aerodynamics and gyroscopic effect. 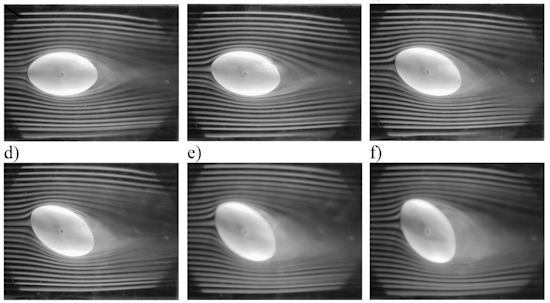 The illustration below visually demonstrates the variation of air flow at different yaw angles of a rugby ball in flight. It can be seen that at 0 degrees there is less air turbulence and hence less air friction to slow the ball down. So how do you keep a ball stable enough to maintain that angle during flight, that's where gyroscopic effect comes into play due to the principles of angular momentum aka the spin. So if someone asks what you do at the rugby club you can tell them you are studying the gyroscopic effect of a prolate spheroid in motion but we'll know you are practicing your spin pass.